In elementary school, our teachers celebrated the start of summer vacation by distributing ice cream packed in tiny cardboard tubs, each fitted with a paper lid that could somehow be folded into a spoon. I can't tell you where they came from—a warehouse club like Sam's, perhaps, or some other place that sold stuff in bulk on the cheap. Cheap was the word, because it wasn't even ice cream: It was ice milk, an extremely low-fat concoction made predominantly of sugar, nonfat milk powder, and air, with just enough artificial vanilla to appease a small child. And yet it was wonderfully refreshing, light, cold, and crisp, like a milk sorbet. Ice milk doesn't have a legal definition in the US, but historically it was a frozen confection containing less than 8% milkfat and stabilized with powdered milk, starches, and gum rather than eggs. A famous example would be Dairy Queen's soft-serve—the FDA considered it ice milk in days of yore, but since the organization revamped its classification system, it qualifies as "reduced-fat ice cream" instead. Between fast food and bulk treats for kids, it's easy to dismiss ice milk as an "imitation" product, but with good-quality ingredients, ice milk is simply a leaner, more refreshing, all-American alternative to fior di latte. What's the Point of Low-Fat Ice Cream? The phrase "fat is flavor" has come to rule the kitchen, but anyone who's ever tasted toasted sugar, pineapple syrup, or lemonade will know that plenty of extremely flavorful foods contain no fat at all. In fact, the very lack of fat can be crucial to some recipes. Strawberry ice cream is delicious, sure, but in terms of pure refreshment it can't compare to a scoop of pure strawberry sorbet. Such is the case with ice milk, which is similarly light and crisp, but with just enough dairy to create a sense of creaminess that feels pleasantly rich—even though it technically isn't. That's what makes ice milk such a treat on a sticky summer day, or when paired with desserts that are already heavy and rich: a warm double-chocolate brownie, for example. Ice milk can be as simple as milk and sugar, but to get the soft and creamy texture we associate with commercial treats and soft-serve, it takes a bit of milk powder and cornstarch, too. Together, these ingredients work to manage the water content of the milk, keeping ice crystal formation in check down the road, for a dessert that's creamy and scoopably soft. Plus, powdered milk bolsters the milkiness overall, giving the finished product a more vibrant flavor. You can find small pouches of powdered milk from brands like Carnation in most any supermarket, but for those inclined to keep a larger volume on hand, shopping in bulk online can reduce the price considerably. (I have a tub from Hoosier Hill Farm at home.) Whole-milk powders will give the ice milk more richness, but low-fat and nonfat powders will keep it light; use whichever you prefer. My version also makes use of lightly toasted sugar to add a hint of caramel complexity while muting the sugar's sweetness. For a batch this size, a quick, 30-minute toasting is all it takes to transform the sugar. The technique for the ice milk itself is as straightforward as they come: Combine all the dry ingredients in a pot, whisk in half the milk, then cook over medium heat until it comes to a boil. From there, keep whisking for a minute as it bubbles in order to fully activate the cornstarch, preventing any trace of chalkiness in the finished product. By dividing the milk, we can develop some cooked, "toffee" notes without sacrificing the lightness and subtle complexity of fresh dairy. As I learned with fior di latte, it's important not to skimp on milk in the first stage, as using too little may leave some of the cornstarch undissolved. The final step is to doctor the ice milk with a splash of vanilla, although it can easily be flavored with other extracts to taste. As with almost any ice cream, the base can be cooled passively in the fridge until no warmer than 40°F (4°C), or it can be chilled to the same temperature much faster in an ice bath. The only benefit to either method is in how it fits with your schedule. 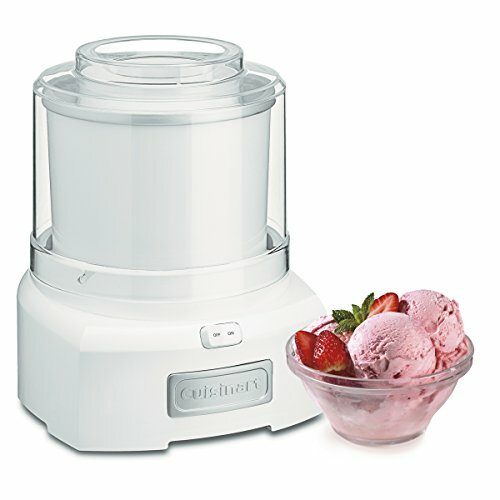 With a canister-style ice cream machine like the Cuisinart ICE-21 (my personal fave, and the top pick from our ice cream maker review), it's vital to confirm that the freezer itself is set to 0°F (-18°C) and that the canister has sufficient time to freeze before churning. I leave my canister in the freezer at all times, so I can churn up ice cream at a moment's notice. Whatever machine you have, don't rush the churning phase. Pulling ice cream off while it has a milkshake-like consistency is a recipe for iciness, and that's doubly true for ice milk. A generous churn time ensures that the dasher can reduce all the fat and ice particles to a small, uniform size, and that the ice milk will achieve proper aeration, for a texture that's as smooth as silk and soft enough to scoop straight from the freezer. In turn, proper churning makes ice milk slow to melt, for a lingering finish despite its lean formula. Thanks to the toasted sugar, added milk powder, and extract, this ice milk has a rich and satisfying flavor even when made with standard supermarket milk. That said, since milk is the primary ingredient, it doesn't hurt to look for local options for that extra-fresh dairy taste. Either way, you'll be rewarded with a smooth and creamy but ultra-light summer treat—no folding spoons required.